Facial liposuction reduces the amount of fat on the jawline, jowls, cheeks, neck and/or under the chin. As people age, the skin becomes wrinkled and droopy while fat begins to accumulate under the chin. Excess fat under the chin is often referred to as having a “double chin” and can occur at any age. These changes can cause the face to appear rounder or squarer and can cause a person to look older than they really are. Additionally, many people turn to facial liposuction to address the issue of “chubby cheeks”. Facial lipo can remove fat from all these troublesome areas to produce a more defined neck and jawline while creating a slimmer, more youthful appearance. Want to learn more about facial lipo? Check out this helpful FAQ! Are there other names for facial liposuction? Facial liposuction is also called chin liposuction, neck liposuction, submental liposuction or a lipectomy (depending on the surgeon). Patients generally just point out that the lower region of their face is looking older than the upper area. A skilled surgeon can pinpoint the sections of the face which will benefit from facial lipo. Who is a good candidate for facial lipo? Although facial lipo is generally a safe procedure, there are certain patients who are ideal candidates for liposuction and those who are not. Pregnant or lactating women should never consider liposuction for any portion of their body. Diabetic patients tend to have wound healing issues, coagulation disorders or cardiovascular disease and might not be suitable for facial liposuction. How is facial liposuction performed? The procedure can be done under light sedation with local anesthetic or under general anesthesia. The surgeon makes tiny incisions within the natural folds of the chin or jawline and inserts a hollow tube with holes called a cannula. The cannula is very small (1-3 mm), has a blunt tip and will be used to break up the fat. The cannula is attached to a special vacuum system which will suction out the damaged fat cells. Sutures are used to close incisions and a support garment is worn to help the skin retract. What is the most common liposuction technique for facial lipo? The most common technique for eliminating facial fat is tumescent liposuction. With tumescent liposuction, patients get results that look more natural than a facelift and there are fewer risks, less scars and a shorter recovery period. During tumescent liposuction, a solution of saline, lidocaine and epinephrine is injected into the treatment area. This solution helps to numb the area, restrict the bleeding and engorge the tissues so the fat can be gently separated and removed. Can facial liposuction be combined with other procedures? Facial lipo is commonly performed in conjunction with other facial treatments. Women often pair it with laser resurfacing or a chemical peel to help reduce the appearance of wrinkles. Facial liposuction can also be performed with other cosmetic procedures such as a lower face and neck lift. In some instances, the fat removed from liposuction may be purified and then reinjected into other areas of the face to add volume. Are there any facial liposuction risks? 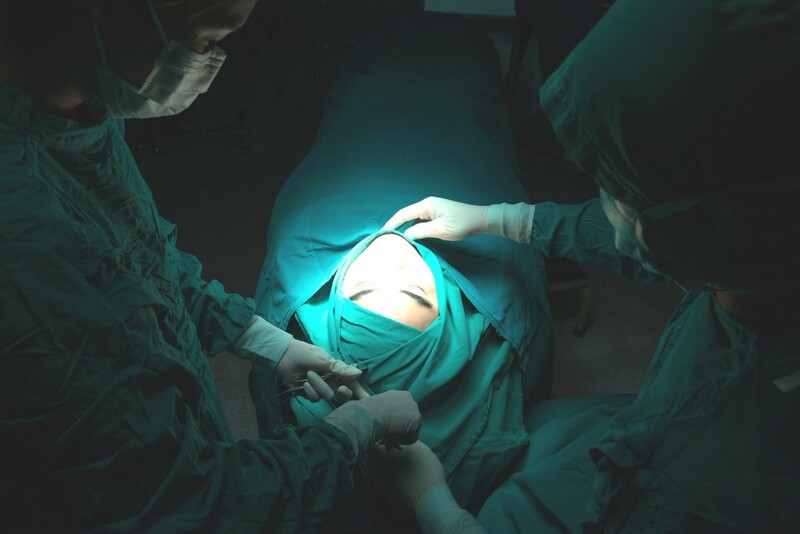 Although facial liposuction has fewer risks than other surgical procedures, it is still a surgery and the possibility of risks or complications can arise. Patients can develop hematomas, necrosis and/or an infection. The risk of a blood clot entering the bloodstream can lead to pulmonary issues, stroke or heart attack. Excessive blood loss during the procedure is rare but can occur. Patients can expect some swelling, bruising and moderate discomfort. The surgeon will provide a prescription for pain medication which should be taken as directed. The amount of swelling and bruising varies per patient but should subside within 10 days. The compression garment helps with these symptoms and should be worn as advised by the doctor. It is important to follow all post-surgical recommendations including staying away from any restricted activities. Do patients have to miss work? The average person will need about a week off work for recovery. A week should provide enough time for the discomfort to subside and the swelling to go down. Patients who are only having chin liposuction may be able to go back to work within a few days since this area generally heals quickly and makeup can cover residual bruising. However, patients who are having facial lipo in combination with other treatments may need a little more recovery time. What are the results of facial liposuction? The results can be noticed after the swelling has gone down. These results are permanent since the fat sucked out will not return. However, the results can be influenced over time if the patient gains weight. Pregnancy and lifestyle factors can also influence the results. Therefore, it is important that patients maintain their weight in order to get lasting results. Is there an alternative treatment for “double chin”? Kybella is a non-surgical treatment for patients who wish to eliminate a “double chin” but do not require liposuction on any other areas of the face. Kybella is an injectable material used to dissolve fat from the cells which causes the body to flush them out. Although Kybella is FDA-approved, many surgeons prefer facial lipo since patients will need 2 or 3 treatments of Kybella over a 3 to 4 month period to achieve their desired results. How many facial lipo procedures does a patient need? Even if patients are having more than one region of their face treated with facial lipo, they can have it all done at the same time. Therefore, they will only need one procedure.